During spring and summer it is not uncommon for people to cross paths with young, seemingly orphaned or injured wild animals. What would you do? Should you feed it? Was it abandoned? Should you take it home? Is it hurt? Is it sick? Does it have a disease you should be worried about contracting? Most times, young wildlife that appear to be orphaned are not and the best thing to do is leave the animal where it is found. Young mammals such as rabbits, raccoons and fawns are typically left alone for hours at a time while their parent feeds. The parent won't return while a human is standing nearby. Young birds typically spend a few precarious days on the ground before learning to fly. Young birds that are found on the ground can be placed in a shrub and the parent will return and feed it. It is a myth that once baby birds or mammals are handled the human scent will keep the parent away. Young wildlife may require care when the mother is known to have been killed or injured. In cases like that or when obviously sick or injured wildlife is found, do not attempt to care for a wild animal yourself. New Jersey has strict laws governing the possession of wild animals. Also, you may cause more problems for an animal than it already has by feeding it the wrong food, pouring water in its mouth or handling it improperly. So what should you do? Fortunately, New Jersey has a number of licensed volunteers, known as wildlife rehabilitators, who can answer questions and if necessary, properly care for sick, injured and orphaned wildlife. Wildlife rehabilitators donate their time and do not charge for their services. They don't work typical office hours and most are available seven days per week to treat and care for wild animals until they can be released back into the wild. Not every rehabilitator has the experience or the facilities to rehabilitate every species so it is best to phone prior to bringing an animal to a rehabilitator for care. Once it has been determined that the animal needs attention, you should get specific directions from the rehabilitator on the best way to capture and handle the animal. Some rehabilitators work with a veterinarian willing to provide medical treatment for wild animals. Under those circumstances, the veterinarian and/or the rehabilitator absorb the cost of treatment. Although some veterinarians may accept some wildlife species in need of medical treatment from the public, they may require payment for treatment of the animal. Before bringing a sick or injured wild animal directly to a veterinarian, potential fees you might be responsible for should be discussed. 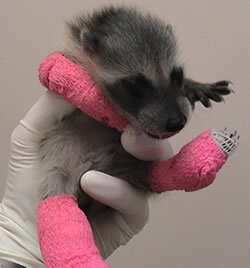 An injured baby raccoon is treated at the Woodlands Wildlife Refuge. In 1998, there were 93 wildlife rehabilitators in New Jersey. Today there are fewer than 40 rehabilitators located in fourteen counties who still manage to rehabilitate approximately 16,000 animals each year. About 40% of the wild animals brought to a wildlife rehabilitator survive and are successfully released back into the wild. Wildlife rehabilitators may be licensed to rehabilitate one or many species of mammals, birds and/or reptiles. In addition to the care they provide to wildlife, rehabilitators answer more than 46,000 phone calls from the public each year. When bringing a wild animal to one of these dedicated volunteers for care, be sure to thank the rehabilitator profusely for their dedication to wildlife and the time and care they provide. They are truly performing a great public service. Being a licensed rehabilitator is a major responsibility and requires time, knowledge and dedication. Becoming a wildlife rehabilitator is not a simple process and includes a 1-year minimum apprenticeship. Rehabilitator applicants must demonstrate they are capable of providing proper care for wild animals in a manner that also protects public health and safety. The licensing process ensures applicants have the proper knowledge and ability to care for injured, sick, orphaned or displaced wildlife from the time they are taken in through the animal's release back into its natural habitat. 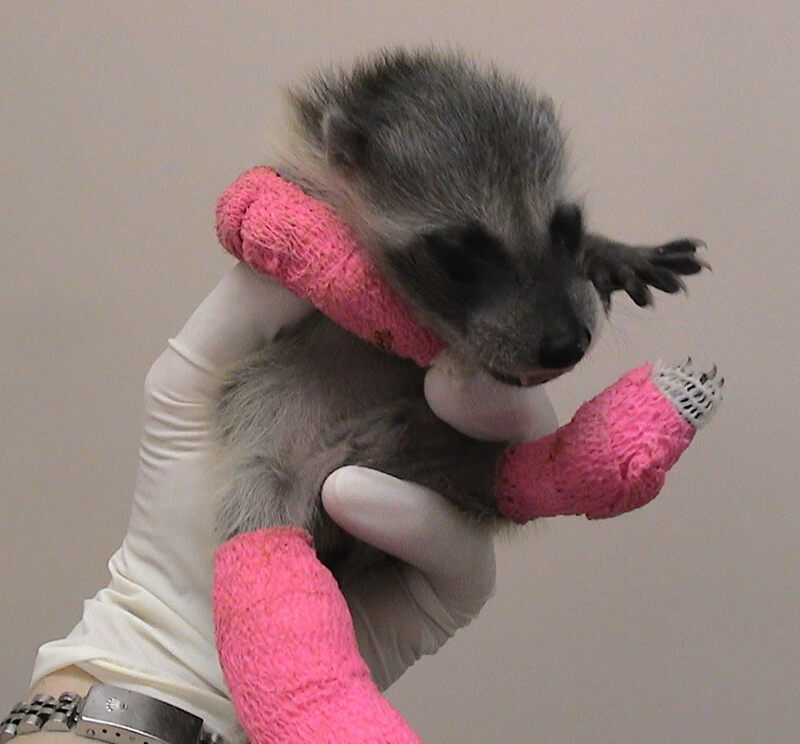 The following links provide contact information for New Jersey rehabilitators, information on the requirements for becoming a licensed rehabilitator, and information about finding injured or young wildlife.